And that’s why we’ve updated this article since originally publishing in on 10/25/16. Get to Know ANSI Standards, the Tile Installer's Best Friend! 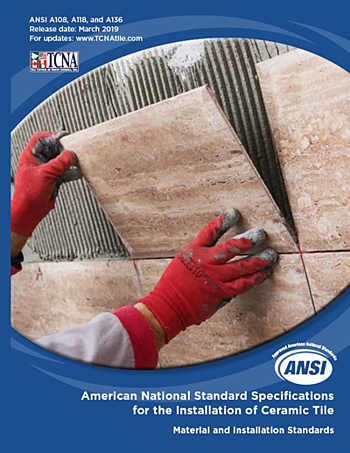 For continued success, tile installers should study the TCNA Handbook and ANSI Specifications, retaining as much as possible or at least knowing where to find the answers. These books can be your best friend as this article - based on a true story - explains. After successfully completing the Large Format Tile and Substrate Prep test - one of the tests contained in the Advanced Certifications for Tile Installers (ACT) program - an installer returned to work installing tile while also being the jobsite superintendent. On this particular day, the superintendent was representing his company at a pre-job conference with the architect since the business owner was not available. The architect reviewed the scope of the job involving the tile installation and said that the job included a 12” x 24” non-rectified porcelain tile which was specified to be installed in a running bond (brick pattern), at a fifty percent offset and a 1/32” grout joint. The now ACT certified installer politely informed the architect that the current ANSI Specification, A108.02 under section 4.3.8, calls for a much different application. To accommodate the range in facial dimensions of the tile supplied for a specific project, the actual grout joint size may, of necessity, vary from the grout joint size specified. The actual grout joint size shall be at least three times the actual variation of facial dimensions of the tile supplied. Example: for tile having a total variation of 1/16” in facial dimensions, a minimum of 3/16” grout joint shall be used. Nominal centerline of all joints shall be straight with due allowances for hand-molded or rustic tiles. In no circumstance shall the grout joint be less than 1/16”. For running bond/brick joint patterns utilizing tiles (square or rectangular) with any side greater than 15”, the grout joint shall be, on average, a minimum of 1/8” wide for rectified tiles and, on average, a minimum of 3/16” wide for calibrated (non-rectified) tiles. The grout joint width shall be increased over the minimum requirement by the amount of edge warpage on the longest edge of the actual tiles being installed. For example, for a rectified tile exhibiting 1/32” edge warpage on the longest edge, the minimum grout joint for a running bond/brick joint pattern will be 1/8” + 1/32” or 5/32”, on average. Of necessity, in any installation, some grout joints will be less and some more than the average minimum dimension to accommodate the specific tiles being installed. For running bond/brick joint patterns utilizing tiles (square or rectangular) where the side being offset is greater than 18” (nominal dimension), the running bond offset will be a maximum of 33% unless otherwise specified by the tile manufacturer. If an offset greater than 33% is specified, specifier and owner must approve mock-up and lippage. “The tile is to be installed in a running bond offset at a maximum of 33% with a 3/16” grout joint." The architect asked the installer where he found this information and how he knew it so well. The installer showed the architect the portion the ANSI book containing that standard and told him that he became aware of this and many other aspects of the industry standards through his studies in preparation for the ACT certification tests. The architect reviewed the ANSI listing and agreed that the specifications would be modified to follow the standard that the installer had described. The tile was installed successfully, and everyone involved was satisfied with the end result. The owner of the tile company, who was absent through this process, is convinced that had they installed the tile as originally specified, the job would have been rejected due to edge lippage, requiring it to be removed and replaced. Since originally publishing this article, we’ve received many questions from readers. Please note that most of the answers to the questions below are contained in the above article, but I have included the answers for each question for clarity. I read the specs. in this web page on rectified or non-rectified tile. We bought Marazzi American Estate tile and was told by Marazzi that a grout line any wider than 1/16 of an inch was too wide. That conflicts with what was said in the Standard. I would like to know if the manufactures specs. conflict with the manufactures which would be correct? “For running bond/brick joint patterns utilizing tiles (square or rectangular) with any side greater than 15 in., the grout joint shall be on average, a minimum of 1/8” for rectified tiles (a tile that has had all edges mechanically finished to achieve a more precise facial dimension), and, on average, a minimum of 3/16” for calibrated (non-rectified) tiles." “The minimum required joint width for ceramic (and porcelain) tile and natural stone tile is 1/16”." I have hired contractors to do a bathroom remodel- using 12 x 24 porcelain tiles- there is excessive lip-page- they are telling the standard allowance is 3/8"
I just had a complete remodel of my bathroom- Contractors are using 12 x 24 porcelain tiles. some joints are 1/8" others are 5/8" with a lot of lippage some even at 6 credit cards deep. they are telling me it is within the standard based on the tile warpage. This is my first home (at 49 yrs old) and will be my retirement home. many chipped and crooked 2 " tiles on the floor and again a lot of lippage . When installing calibrated or rectified tile, the grout joint width would not range from 1/8” to 5/8”, but rather it should be of a consistent size. Is it acceptable for a contractor to chip any existing tiles when doing grout work per industry standards? The ANSI requirement under A108.02 section 4.3.3 states, “Smooth cut edges. Install tile without jagged or flaked edges.” This would be true for a new tile installation as well as repair work being completed on existing tiles. Reworking or regrouting an existing tile installation is very difficult and problematic. If in the course of this work, if a tile(s) is/are chipped, it should be replaced prior to installing the grout. In these instances, extra tiles of the same dye lot or run as the floor to be repaired should be on hand before attempting the repair. I am having my house renovated. One of the tasks is laying 24" x 24" porcelain tiles. The contractor has prepared the floor but I see quite a number of bumps on the floor which are more than 3/8" and some even1/4" high. These were formed when he lay the wire mesh and then poured the cement on top. But the cement doesn't seem to cover the mesh uniformly, especially where the two meshes join. I told the contractor that the floor is not level but he says that is ok and it will be taken care of by the mortar. But I am not comfortable with that after reading various articles on tile laying requirements. He insists his installer knows what he is doing and isn't prepared to do any changes. He is implying that I am questioning his installer's competency. How do I convince him to smooth out these bumps? I cannot ask him to not continue as the tile installation is part of the whole renovation. Any ideas are greatly appreciated. Ahmad, The method you describe is similar to the TCNA Handbook method F145 where a minimum 2.5 pound/square yard expanded metal lath is nailed or stapled to the minimum 23/32’ tongue and groove exterior glue plywood subfloor with a 1/8” gap between the sheets. This detail calls for the mortar bed being placed over the metal lath to be between a minimum of 3/4” to a maximum of 1-1/2” thickness. The mortar thickness would easily cover the metal lath (and where two layer of mesh overlap) and provide a surface which meets the flatness requirement of tiles with any edge longer than 15”. This surface must be within 1/8” in 10’ which means that there can’t be any gap greater than 1/8” between the 10’ straightedge and the floor surface. Additionally, thin set or large and heavy tile mortars are not intended to be used in truing or leveling the work of others. Sindy, You did not indicate what the reason was for the tiles being installed improperly, but they should not be cracked or bulged. Since wall tiles are not walked on, the cracking could be from a structural fault in the house or the contractor applying the conventional thin set mortar beyond the manufacturer’s recommendation of ¼” after the tile in embedded. For large format tiles (your 12” x 24” tile is included) installed using large and heavy tile mortar, the maximum mortar thickness is ½” after the tile is embedded. When either mortar is installed beyond the manufacturer’s recommendations, the mortar can shrink excessively causing the tile to crack. The bulging tiles could be the result of the wall surface not being flat within the ANSI requirement of 1/8” in 10’. This means that there can’t be any more than 1/8” between the 10’ straightedge and the wall surface. I have a question about tiling standards after an accident in my bathroom. My 11-year-old daughter stepped on unsupported tiles between the bath and the wall and cut her leg quite badly as she fell through the broken ceramic tile shards. The tiles were installed to cover the more than 200 mm gap between the bath and the wall and were grouted and finished to give the impression of a sturdy structure. There was no support under the tiles for the full span of the gap. Eban, I am sorry to hear that your daughter was injured and hope that she has recovered fully. You did not mention whether the floor under the tile was concrete or wood, but the more than 200 mm gap is well over eight inches in width and is not unacceptable. The void being properly addressed would be the responsibility of the concrete contractor or the carpenter, but in either case, the tile installer should not have installed the tile until the deficiency was corrected. The ANSI specification for a wood or concrete are clear and call for the surface to be structurally sound which unfortunately was not the case in your bathroom. Get to Know the Tile Installer's Best Friend! This ANSI Standards-based knowledge saved this contractor a significant amount of time and potential expense. 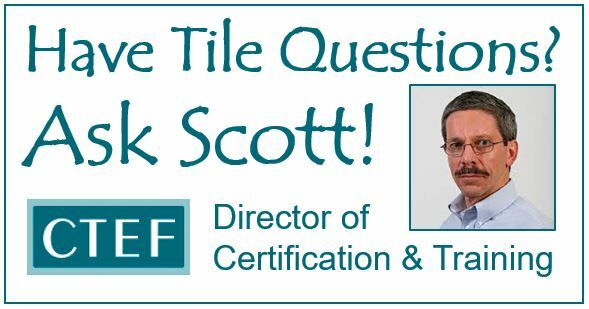 And, as you can read from these reader questions, following ANSI Standards ensures better tile installation outcomes. Using knowledge wisely can reap large benefits. Wouldn't you agree? Have you encountered tile installation situations where the ANSI Standards were truly your best friend? Please share your experiences with us. Note: This article was originally published on October 25, 2016 and has been updated.